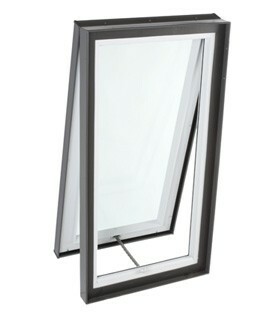 Choose the control to open and close your manual venting skylight. The VCM skylight installs on site-built curbs with slopes between 0° (flat or 0:12) and 60° (20:12). The VCM skylight is easily opened and closed manually with VELUX control rods when installed out-of-reach. A smooth turning handle with a white finish is available when skylights are installed within reach. The new innovative Pick&Click! ™ brackets make blind installation a snap! Every VCM skylight comes pre-installed with Pick&Click! ™ brackets that allows for fast and easy installation of sunscreening blinds and accessories. Blackout Blinds – Blocks 98% of the light. Available in solar only. Light Diffusing Blinds – Diffuse the light and eliminates the glare. Available in solar only. The VCM skylight is designed for simple and weathertight installations on site-built curbs. It features factory applied gaskets to seal out wind and water for a weathertight installation. The VCM skylight is constructed with maintenance free white frames and sashes that insulates and strengthens the unit. A steel chain operator that eliminates the need for any interior attachments is also included.